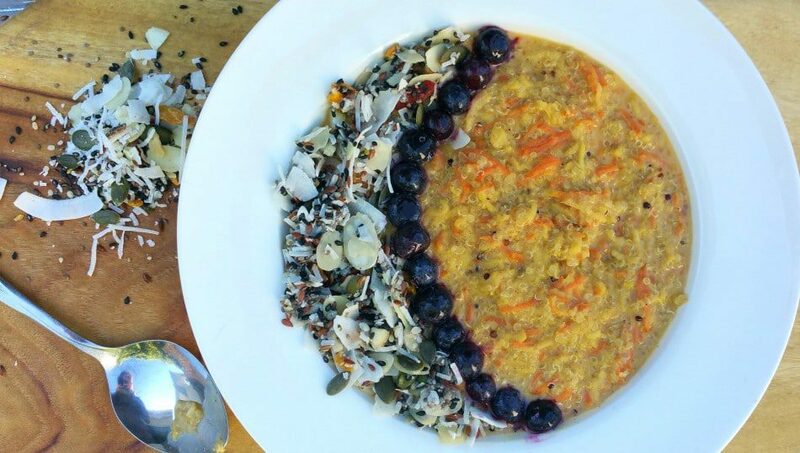 This is a great gluten free, winter warmer breakfast for those carrot cake/porridge lovers out there! 1. Cook the quinoa with the almond milk for 15 minutes until it’s mostly absorbed. 2. Then add the rest of the ingredients and cook for another 5 minutes until thick and creamy. 3. If you decide to use the eggs, remove the cooked porridge from the heat and whisk in the eggs vigorously until cooked through. This will add some extra protein to your porridge and also makes it creamier. If you don’t mix it fast enough the eggs make cook through in lumps making scrambled eggs in your porridge (yuck)! 4. Serve with the Neoblend for the yummiest combination! Thanks to Candice Allum for this awesome recipe! !